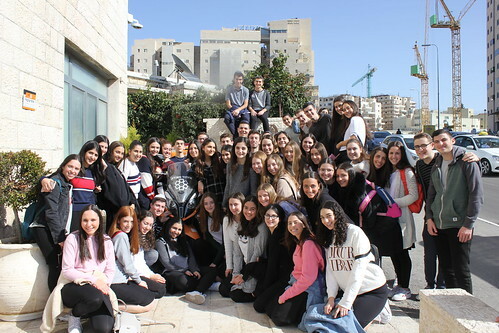 After another morning of the delicious Inbal breakfast, we began our 3rd day of Chesed Mission at Aleh - a school and facility for children with neurological disabilities. We divided into a bunch of rooms where we interacted with the children. Then we all joined together for a big dance party which we all loved. Next we went to United Hatzalah to learn about the amazing life-saving work that they do. We had a surprise visit from Eli Beer, the founder and president of United Hatzalah who taught us the Heimlich maneuver, showed us the dispatch center, and took us down to the bunker that is set up to be a command center in case of a war. After a stop for lunch where we got to enjoy the beautiful weather in an outdoor mall in Ramot, we went to visit the indescribable Shalva. This magnificent, state of the art organization services over 2000 children and young adults with special needs each week. We got to meet Yossi whose parents started Shalva when he became blind and deaf. Then we had a really fun dance party, prayed Mincha in the beautiful Beit Midrash and took a picture on the roof where we got to take in the breathtaking view of Jerusalem. Then we were off to Susan’s House a rehabilitative occupational programs for adolescents who are at-risk These young adults are taught to make art. We had an opportunity to buy some of the beautiful things that they produced.